At 0.8 mm in length and 30 µm in diameter, our USP 12-0 microsurgery needles with attached micro nylon thread are the smallest suture needles in the world. 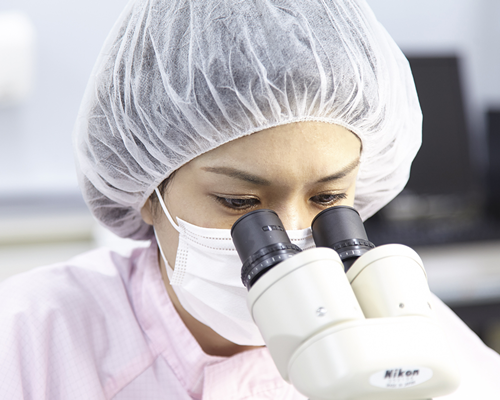 Our micromachining technology enables us to manufacture suture needles of a quality high enough for supermicrosurgery. The quality of our micro nylon thread is extremely consistent. 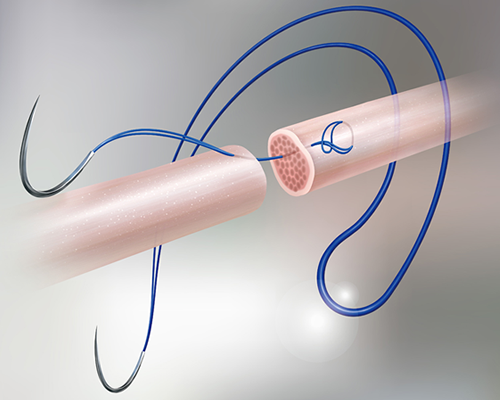 In Japan, our Crownjun micro nylon suture thread is preferred by most surgeons who perform procedures such as lymphaticovenous anastomosis when surgically treating lymphedema. The high quality of our 11-0, 10-0, and 9-0 suture needles is underpinned by our technical capacity for manufacturing high quality 12-0 suture needles. 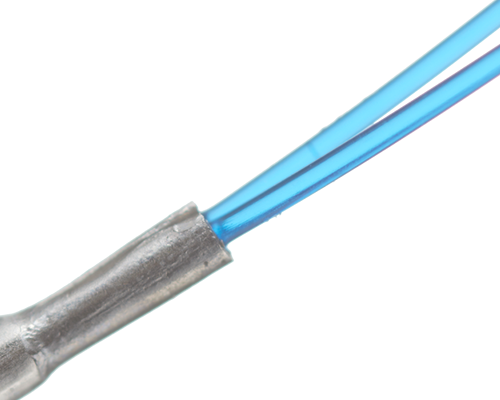 Furthermore, our suture needles have also long been used for conventional microsurgery. In 1965, our suture needles with attached micro nylon thread were used in the world’s first successful thumb replantation surgery. From the birth of microsurgery to the current age of super microsurgery. We endeavor to contribute to society through our micromachining technology. Kono Seisakusho manufactures microsurgery needles with attached micro nylon suture thread, in a range of sizes from USP 8-0 to USP 12-0. We manufacture the smallest suture needles in the world—USP 12-0 microsurgery needles (0.8 mm in length, 30 µm in diameter) with attached micro nylon thread. Since their development in 2004, they have earned high praise from microsurgery professionals performing blood vessel and nerve reconstruction under 3–20 power magnification. The high quality of our USP 11-0, 10-0, and 9-0 suture needles is underpinned by our technical capacity for manufacturing high quality USP 12-0 suture needles. Most doctors performing microsurgeries in Japan use our suture needles. Non-absorbable, sterile, surgical polyamide monofilament suture. 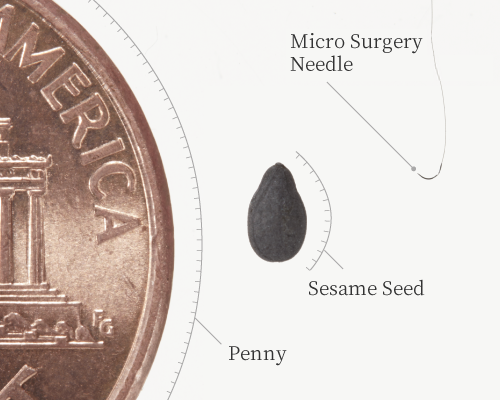 The smallest suture needles in the world: 0.8 mm in length, 30 µm in diameter. A full set of varieties is available for use in lymphaticovenous anastomosis, flaps, digital replantation, hepatic arterial anastomosis, etc. A wide range of needle and thread sizes. Double-arm suture needles for liver transplantation and back-wall techniques, etc. The Tsuge suture method involves tenorrhaphy using a loop needle. The greatest advantage of the Tsuge suture is that minimal disruption of blood circulation inside the tendon compared with other procedures,which promotes the healing of the suture area. The Tsuge suture also has the advantages of being easy to perform, quick to be completed, and able to be used in small operating fields. Several decades have passed since the procedure was developed, and many new forms of tenorrhaphy have since been developed. Some forms use two-strand sutures (Kessler and Kirchmeier techniques), some use four-strand sutures (double Tsuge technique), some use six-strand sutures (Yoshizu and Tsai techniques), and some use peripheral sutures. Many surgeons have verified the effectiveness of loop suture needles for suturing in tenorrhaphy, and developed new techniques using them. Dr.Tsuge’s looped suture needle was the foundation for these developments. Tsuge looped suture needles were developed by Kono Seisakusho as a tool for making Tsuge sutures at the request of Professor Kenya Tsuge. These needles have been used along with Tsuge sutures by surgeons around the world for over 40 years. Looped sutures require high quality manufacturing techniques. Attaching two threads to one needle requires great technical skill. Crownjun Looped Sutures are made using our advanced manufacturing technology. Sharp, specially shaped, cutting needles. Different threads for different requirements. Tsuge looped sutures are a product unique to Kono Seisakusho. Sep. 2018 We will exhibit our Microsurgery suture at the ICSM in Jinan, China from October 12th to 14th, 2018. Apr. 2018 Try our Microsurgery sutures at EFSM exhibition area in Belgrade ! Apr. 2018 Our items were posted on the website "Medical Takumi Japan"
Mar. 2018 We will exhibit our Microsurgery suture at the 14th EFSM in Belgrade from May 5th to 8th, 2018.